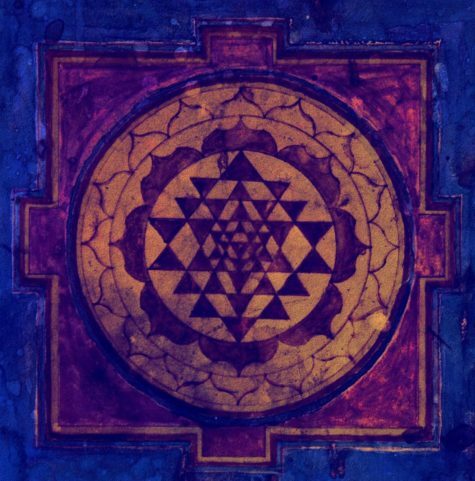 The Holi Sri Yantra, also known as Sri Chakra, is a very important symbol of the Hindu philosophy known as Tantra. It is composed by nine triangles of different size overlapping with one another. The upper side of the diagram symbolizes Shiva and the masculine, while the bottom part represents Shakti, the Feminine divine also depicted in the Yoni Yantra Mandala. The Sri Yantra portrait the expansion of the universe starting from the center of the mandala and describing the union of feminine and masculine energy. This Mandala is a great visual aid to reach higher states of consciousness and deep meditation. The secret key to using Yantras in meditation is Resonance. The process of Resonance is established by mental focus on the image of the Yantra. As long as the mind is tuned into the specific mood associated to that Yantra, the energy flows, but when the Resonance is stopped, the energy disappears. Hang the Shri Yantra mandala on a wall facing North or East, placing the center of the Yantra at the level of your eyes. Adopt your favorite posture or, if you want, sit on a chair maintaining a straight spine. Breathe in through the nose and out through the mouth, but do not force at all, just let the breath flow normally. Look into the center of the Yantra, trying to blink as rarely as possible; you don’t want to look at the particular details of the Yantra, just keep your sight right in the center and observe the whole Yantra at once. This exercise should last at least 15-30 minutes every day; the experience will be indescribable. When executing this technique it is recommended that we maintain a state of aspiration and intense longing for experiencing the beatific energies of the consciousness. In superior phases the shri Yantra Mandala absorbs the practitioner’s complete attention, and he can no longer tell if the Yantra is within himself or if he is within the Yantra; this is the state of nonduality. The yantra image in this post can be enlarged (click on it) copied, and printed, and then used for this meditation. More yantra mandala images can be found at Mandala Madness. At Lughnasadh (August 1st), the harvest is kicking in. This is a time of year when the masculine energy of the earth is in full swing. For starters, it’s the season of the spirit of grain, and a time to honor Lugh, the craftsman god. Lugh was not only a craftsman, but a gifted smith and swordsman. The season from late summer to the middle of fall is often a season of heightened energy for those who identify with the warrior soul. The warrior in today’s society is someone who understands the idea of right action. He or she follows a code of honor, and abides by that code even when it may be inconvenient or unpopular. The warrior recognizes that the forces of creation and destruction must be balanced. The warrior is empowered because he or she knows his own circumstances, limitations and goals. Perhaps most importantly, the warrior is someone who has made past mistakes, owned up to them, and learned not to repeat them. The notion of masculine energy and a warrior soul is not exclusive to men. Many women have powerful warrior spirits. Think of the warrior soul as an archetype of personal empowerment. Indeed, throughout history, many women have been known as mighty warriors. 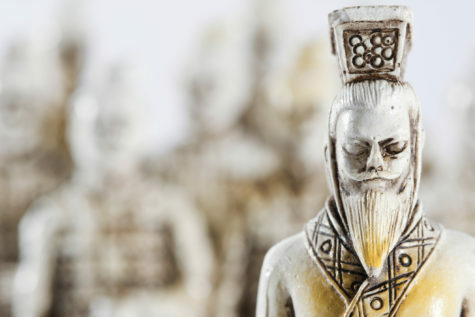 If it helps you get in touch with your inner warrior, envision some of them as you work. Picture Boadicaea of the Iceni, conquering the Roman army, or Penthesilea battling her lover, Achilles. If you lean towards more current history, consider France’s Jeanne d’Arc, or Grainne’ ni Mhaille, the Irish pirate. For those who connect best with pop culture, even television’s Buffy the Vampire Slayer, Firefly’s Zoe, or Xena make perfectly good warrior woman archetypes. You may wish to prepare your mind and body prior to starting the meditation. Some people like to take a ritual bath as a method of cleansing the body, and clearing the mind. If you wish, you can anoint yourself with Blessing Oil or another oil of your choice before beginning. Since you’re performing a warrior meditation, why not try adding a bit of war paint to your face amd body? Before getting started, make sure you can work undisturbed somewhere for about an hour. Turn off the cell phone, get off the Internet, and send the kids off to play with friends for a while. Perform this meditation outside if at all possible. Set up a small altar that you can sit in front of. Since you’re working outside, consider using a flat stone or a tree stump as a natural altar. On it, place symbols of the warrior spirit: a knife, a drum, an arrow, a shield — anything that helps you connect with your inner warrior. If you have ancestors or loved ones that represent the warrior archetype to you, feel free to include photographs or other heirlooms. Finally, add a purple candle – purple is the color of royalty and power, and of honor. Although this meditation is designed to be performed solo, it can easily be adapted into a group practice, or turned into a full-fledged ritual. Sit before your altar, and light the purple candle. Focus on the flame, and visualize the fiery passion of the warrior soul. Think about the things you’ve done in your life, incidents in which you should have taken one path, but instead chose another. Consider mistakes you’ve made, and how they’ve affected not only you, but other people. Think about the consequences of these actions. Did you learn anything from these events? Take this knowledge of past action, and move it into the present. As a warrior, you have followed a particular path to get to the present, one with many roadblocks, twists, and obstacles in the way. How has this helped to shape the person you are now? Think about the person you have become, and how you have grown during the different experiences you’ve had. Now, think about the person you wish to be, and how the past and present will influence the future. Understand that for you to follow a principle of right action, there may be times when you make decisions that are unpopular. Are you willing to stand up for your convictions? Are you willing to live in a manner that will earn you the respect and honor of others? To do this, you must first and foremost honor and respect yourself. One way to live rightly and with honor is to make a pledge, both to yourself and to the gods of your tradition. in my deeds, words, and actions. but in wisdom, and courage, and strength. and follow the code of the warrior. and I have control over my mind, my thoughts, and my sword. and to stand on behalf of those who cannot speak for themselves. and I shall live with honor. While you do this, envision the warrior archetypes that you wish to emulate. Who are some warriors you look up to and hold in high regard? Think about them, and draw their energy into you. When you are ready to end the ritual, put the candle out. Calming sounds of running water for meditation.